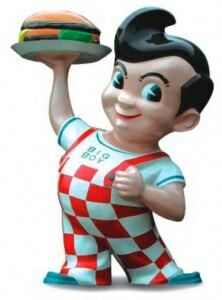 When I first came to L.A. in 1993, one of the places I really wanted to go to was Bob’s Big Boy. The reason being I had long been into American cars and knew that Bob’s was right at the heart of the original Hot Rod and cruising scene. It felt great the first time I went to the traditional Friday Night at Bob’s wandering around some amazing cars. It is very hard to convey then, just how it feels to now only visit Bob’s Big Boy, but to be parked right by the walk up window on Friday Night at Bob’s in my own Ariel Atom. The feelings of being not real came flooding back as did the Cheshire Cat grin! Probably this is a cheesy thing to say, but it really felt like I had got a huge piece of my personal “American Dream”. I was there with my friend George Hartmann who is also the Master Distributor of SponsorDaddy. We call this “Attraction Marketing”. Even though this was so much fun and such a cool thing to do, in handing out fliers about the Atom, we are actually also doing business!! This means that Uncle Sam is kind enough to pay me $0.55 per mile to go to Bob’s and he also bought the burgers! I can’t think of much better! As always there were top notch cars there. My Mopar lust was fuelled again by an awesome RoadRunner that parked right next to me. The Oldsmobile 88 below was outstanding. It looked brand new, but smelled like it was still in the 50s (the windows were open and I stuck my nose in). Bob’s Big Boy has added solar panels to the parking structure which will generate 1/3 of it’s electricity. Pretty cool that such an old established entity is taking the reins on eco action. Local Channel 7 were there to cover that story last night and there are glimpses of the Atom on their report here. Honestly, this is the most attention that the Atom has ever had at a show. Almost all was very cool (whoever turned off the master electric switch and made it look like it was on was not cool at all). George and I went to Bob’s Big Boy through a Canyon which shall remain nameless. The Ariel Atom is simply the most stunning experience imaginable even after all this time I’ve owned her. Breathtaking performance through a breathtaking Canyon. It’s impossible to convey what she feels like through twisties, especially uphill twisties. I can’t tell you how it feels to do that, end up at Bob’s Big Boy, be doing business and getting paid to do all that! I have to say I can’t imagine how it gets better and I am very grateful for the business choices I’ve made that have got me there! We took the Freeway back after a very cool few hours. If you’re in L.A. and you like cars, make it to Bob’s Big Boy on a Friday from 5-10PM – always worthwhile and if you’re like me, an amazing American cultural experience.